Oh la, la the theatres and musical halls of gay Par-ee were the big attraction in the halcyon days of the musical comedy. Rows of pretty girls high kicking in unison was the show stopping number still known today as the Can-Can. Eyecon has paid homage to this legendary attraction by devoting a slot game to it. And very pretty it is! The theatrical back drop frames the reels with lush, red stage curtains. Beneath the reels, you will notice the play and setting buttons are on the back of seats. It has twenty-five bet lines and the five reels spin on a clean, white background allowing the nicely designed symbols to take the spotlight. All in theme, the symbols include line payer, playing card values, Jack to Ace. The medium line payers include, a ladies parasol, a Masquerade Mask, a ladies shoe, A Masquerade Head piece, a bottle of perfume, the Eiffel Tower, a windmill, a rose, the theatrical happy/sad emotion masks and the famous, Moulin Rouge. We have a dancer as a Wild and two scatters represented by the Happy and Sad emotion masks. There is a free spins feature and this is activated by landing three or more of the Sad or Happy Mask scatters anywhere on the reels. This will award you six free spins and during free spins play any wins are multiplied by 3, however this can increase or decrease depending on which Mask appears. You can pick up extra freebies for each Happy Mask that appears on reel five. No soundtrack as such but the jolly thumping Can Can theme plays when the dancer wild is in play and she comes to life with a cute animation. She replaces all other symbols bar the scatters and can boost any winning combos she is a part of. Discover our top casino games here! Finally you have the option to Gamble any of your wins. A game of choice, choose right and you can double your win. Choose right again and you quadruple your win, however choose wrong and... well you loose... It all. Really takes the oh la, la out of the proceedings that does. Oui, Oui, Monsieur. As mentioned, the back of the audience seats provides a neat button panel and left to right you will find, options for game settings, bet settings and line settings, the spin button and next to that the auto spin button. On the end is the Gamble button. It isn’t a new Easy slot, however it remains popular today and has a good main game jackpot worth playing for and, as with most offerings from Eyecon, it has a nice extras package and easy playability. 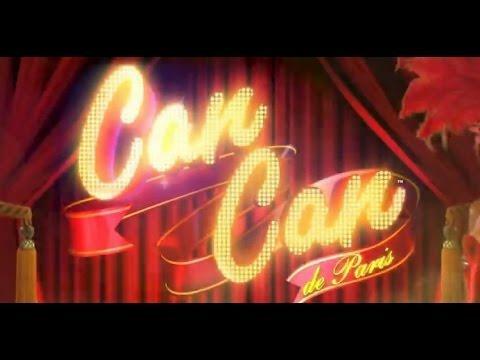 If you love the theatre and a little ‘old school’ flavour in your slot game, then Can Can is for you. 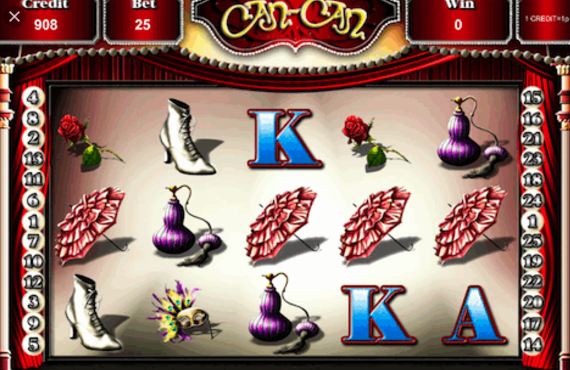 Can Can is a very easy, simple slot to play from Eyecon. Anyone interested in theatre and dance, will be attracted to these. The graphics aren’t particularly outstanding, but it doesn’t matter, this is a gentle play with a medium to good payback ratio that should be attractive to most kinds of players, especially those that like a the old style slots. An equally cool game is waiting for you, click here!